Jovan Hadzic (1799-1869) was the first president of the Matica Srpska and its founder, Serbian writer who worked in the 19th century and contributed significantly to the development of the culture of the Serbian people. He wrote poetry, under the pseudonym Milos Svetic. For many people, he is known as an opponent of Vuk’s reform of the language. Vuk Karadzic and Jovan Hadzic have been in conflict for years, until Djura Danicic released “The War for the Serbian language and spelling” in 1847, thus revealing arguments of Vuk’s reform and breaking down all who opposed it. Jovan Hadzic had written a wealth of literature in the 19th century. His poetry, and his failure to thrive and negative reviews are probably caused by his opposition to Vuk’s reform of the language. Bust of Jovan Hadzic is in front of the Matica Srpska, with 5 other busts, also prominent figures in Serbian history. 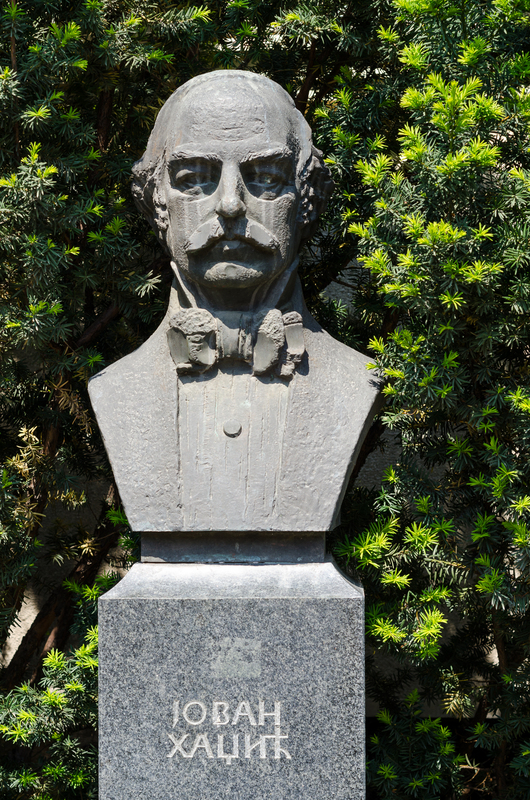 The bust is made of bronze and is the work of the famous Belgrade sculptor Alexander Zarin.